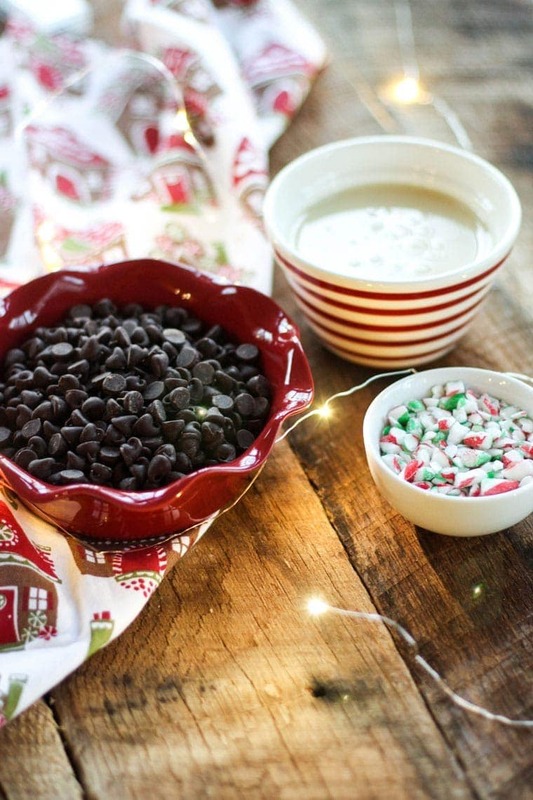 Here’s an easy fudge recipe to add to your holiday cookie trays! 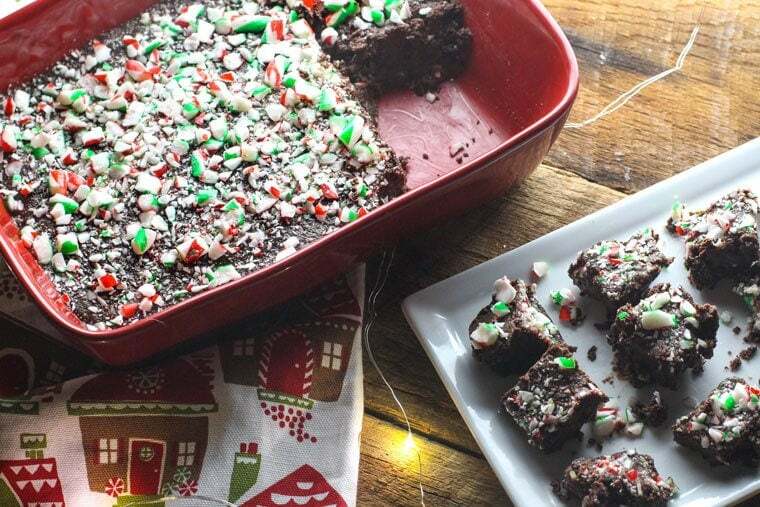 Christmas Peppermint Fudge is a rich, decadent dessert with hints of peppermint and crushed candy canes on top for a festive holiday treat. 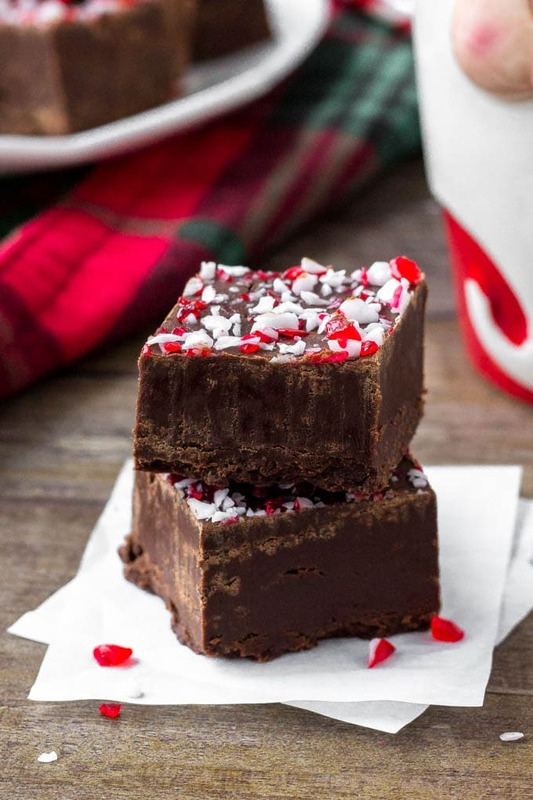 If you’re looking for the perfect thing to bring to your cookie exchanges, try this Peppermint Fudge! 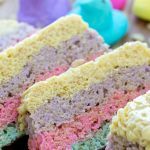 It takes no time at all and you only need five ingredients. I’m always a sucker for a chocolate and peppermint combo especially during the holidays. 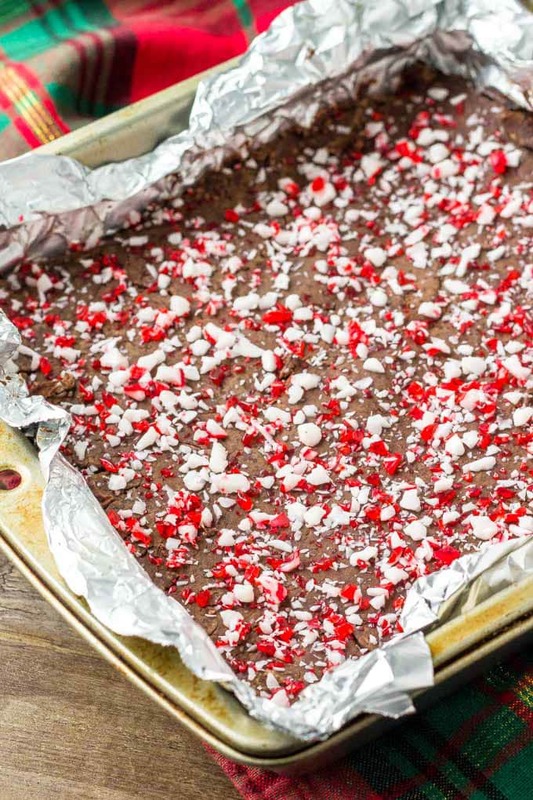 I could probably eat peppermint bark everyday and not get sick of it, but making it can take a while to prepare which is where this Peppermint Fudge comes in really handy! You only need one pot and five ingredients so prep and clean up is a breeze. It follows the classic 3-to-1 ratio of chocolate to sweetened condensed milk with a few more ingredients added for more flavor. 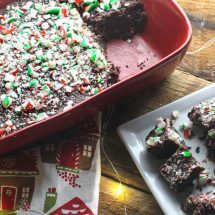 I added butter in to give it a little more richness and some peppermint extract to make sure there was peppermint flavor throughout the fudge and not just on top. There’s enough in the recipe to be subtle, but if you’re the type of person who loves peppermint, I’d recommend adding another 1/2 tsp of peppermint extract. 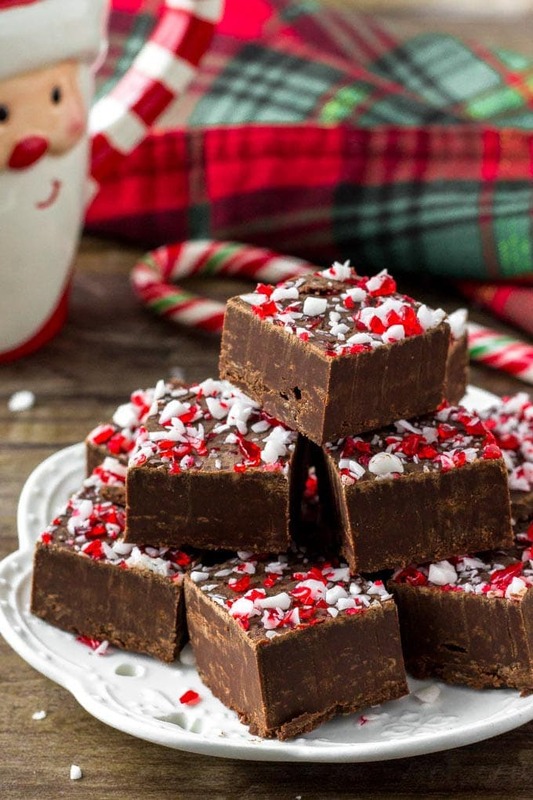 You only need FIVE ingredients to make this delicious and super easy fudge recipe! 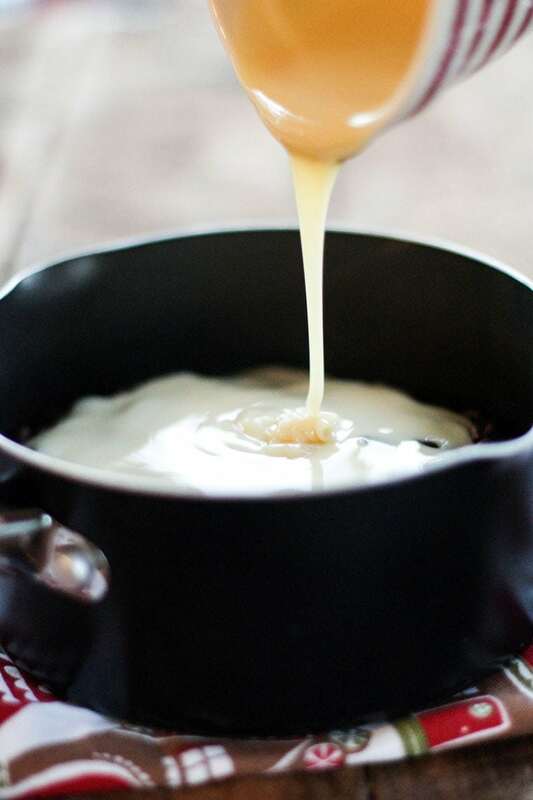 Microwave – Easy, but temperamental with the chocolate and condensed milk. Great if you’re short on time. Put all the ingredients in a large bowl and zap it 30 seconds at a time until everything is combined. Stovetop with sauce pot- Again, easy. I just use a sauce pot and consistently stir the mixture to make sure nothing gets stuck on the bottom. Be sure to keep watching and stirring! 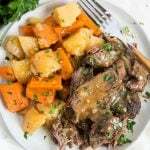 Stovetop with double boiler – Also easy, but I know not everyone has a double boiler. You can stick a glass bowl on top of a sauce pot with simmering water over it to give you the double boiler effect. It’s more consistent for the chocolate and lessens your chance for having your chocolate burn! With any of these methods, be sure to keep stirring and combining everything. There is nothing worse than taking your eyes off of melting chocolate and having it seize! Anyone you’ll give this to will taste the love that’s in it from your watchful eye! Line a pan with foil or parchment paper before pouring in the fudge mixture, leaving some sticking out around the sides for easy removal. I put my fudge in a 10-inch x 7-inch pan and got about 30 pieces that were pretty thick. 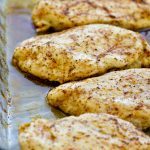 You can also use a 8-inch x 8-inch pan for about the same amount. A 9-inch x 13-inch pan will also work, but those will turn out pretty thin. The longer you keep them refrigerated before you cut them, the better they will stay together. 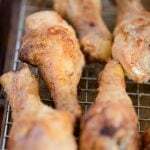 I recommend refrigerating for at least 2-3 hours before cutting. Lift the foil out of the pan and transfer the fudge to a cutting board. 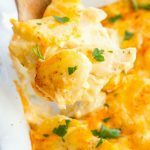 Remove the foil and slice into squares with a sharp knife. Do not cut on the foil as you could end up with bits of it stuck to your fudge. To store, place fudge in layers separated by parchment paper, in an airtight container. Fudge will keep for 1-2 weeks if stored are room temperature, or 3 weeks in the refrigerator. If you’re looking for more cookies to bring to your holiday parties, check out these Classic Peanut Butter Cookies or Oatmeal Kiss “Blossom” Cookies. Haven’t decided what to make for your Christmas morning? Try this Creme Brulee French Toast. 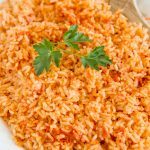 You can prepare it the night before and cook in the morning! 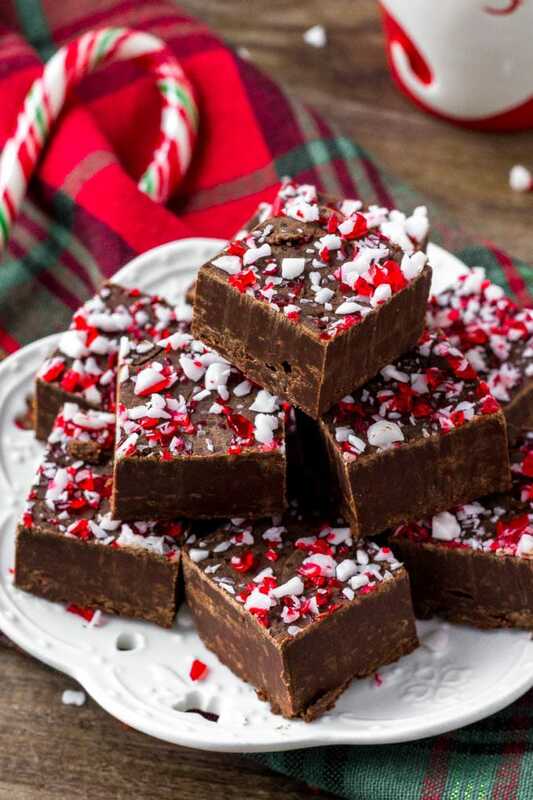 This Peppermint Fudge is an easy fudge recipe that's so simple to throw together and will be the favorite of your parties! 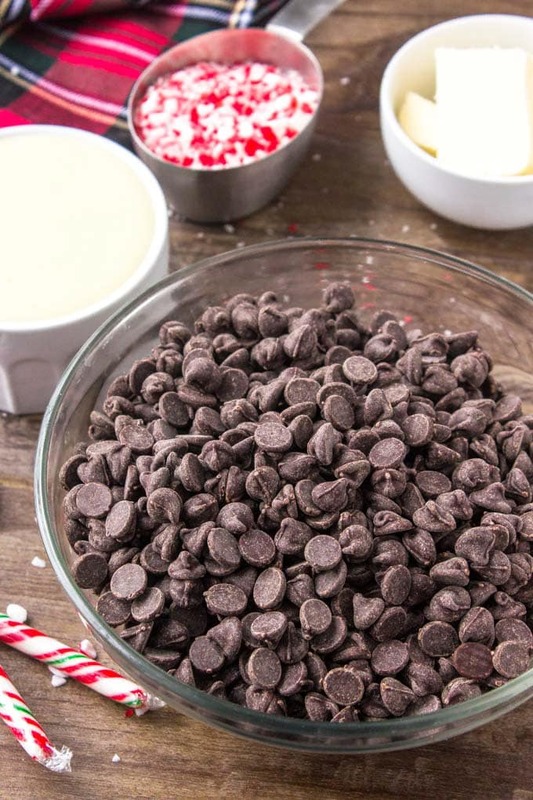 In a large sauce pot, add in chocolate chips, condensed milk, butter, and peppermint extract. Over low heat, stir constantly until combined. Be sure to scrape the bottom of the pan to avoid any chocolate burning. Pour mixture into a 8-inch x 8-inch pan and even out the top. (11x7 or 9x13 will work as well, though a larger pan will yield a thinner batch of fudge. 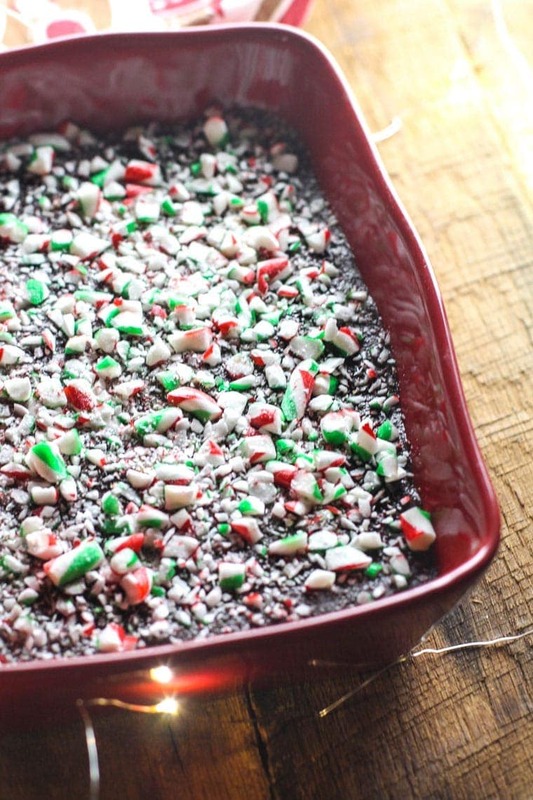 If you're putting crushed candy canes on, let cool for 10 minutes and sprinkle on top. Cool in the refrigerator for 2-3 hours before cutting. 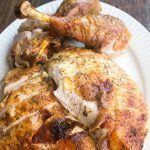 Cut into 1 inch pieces and serve! 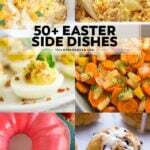 For all desserts go HERE and for the Recipe Index go HERE.